It seems to me that the colder it gets, the warmer the people. 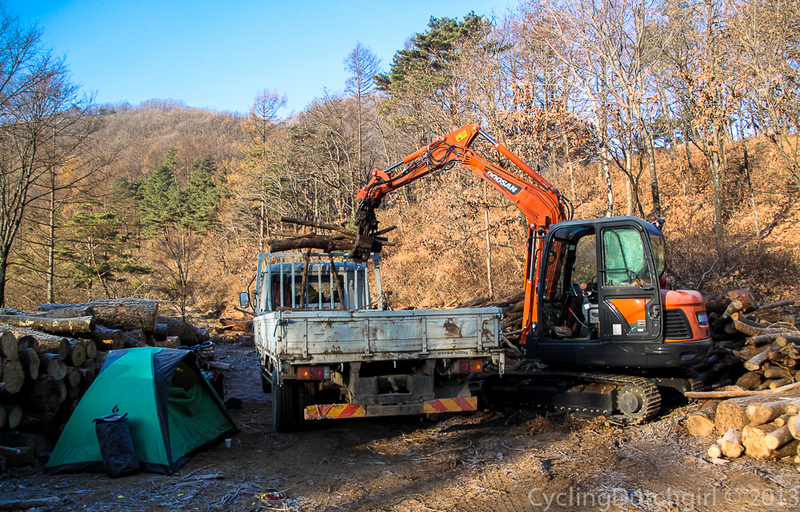 In the last few weeks on the road we camped less than a hand full of times. There’s a few good reasons for this. This far north we came across the military everywhere, even in a temple, where they gave me enough sweets to last for the rest of my time in Korea. On the road every third vehicle seems to belong to the army, we see them in restaurants and shops. 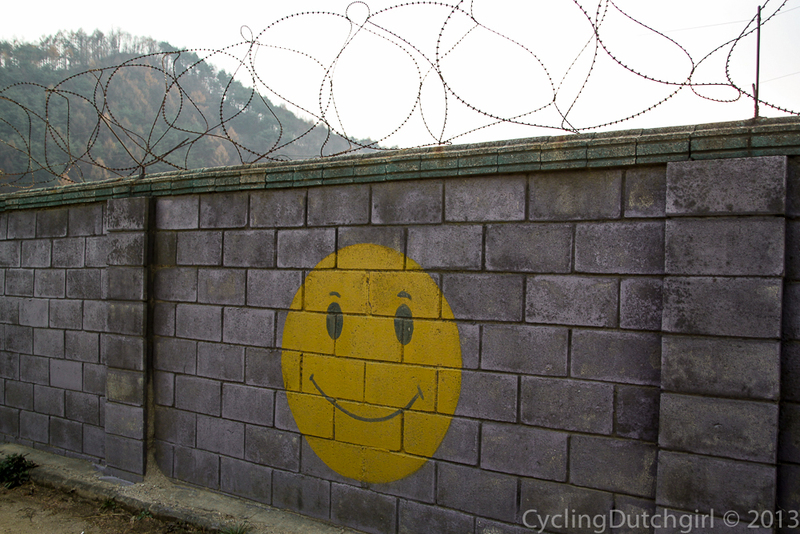 Barbed wired walls, at least with smiley faces. We tried to find a nice place to camp along the river but were a little worried about all the mine-signs. 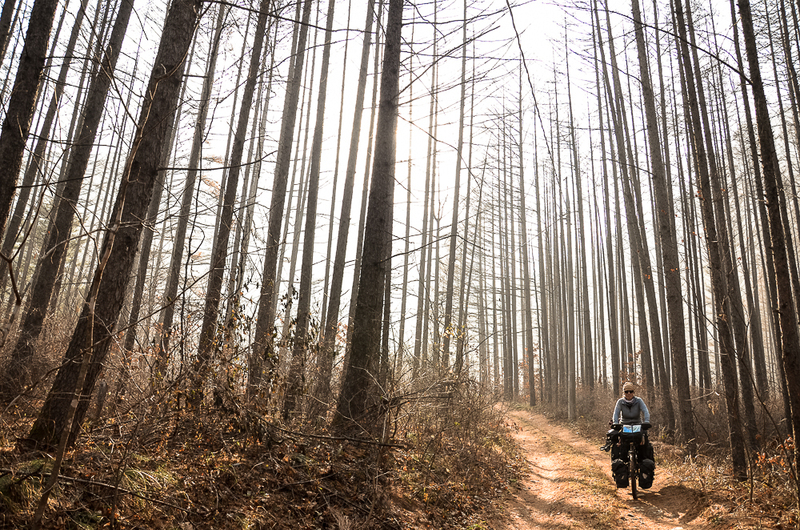 Not feeling much for getting blown up we rode until the small village off Haean-myeon, where a young girl tried helping us find a good place to camp. That might have been a slight exaggeration but he was right that the temperature here is well below zero at night. So they organised for us to stay in the local community centre. Where not only did we have the luxury of sleeping on a heated floor, there was also a hot shower, fully equipped kitchen and a massage chair! The next morning the care taker called around to invite us over for breakfast and took it upon himself to give us a private guided tour of the area. 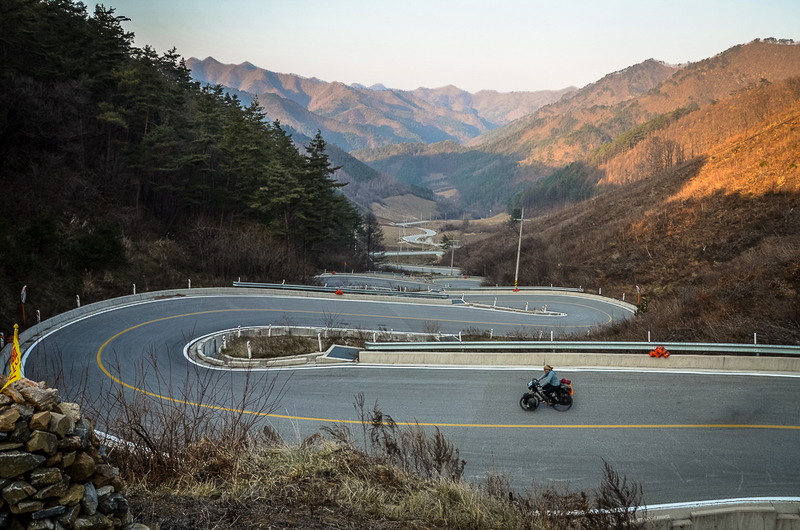 Including the viewpoint where you can gaze into North Korea. 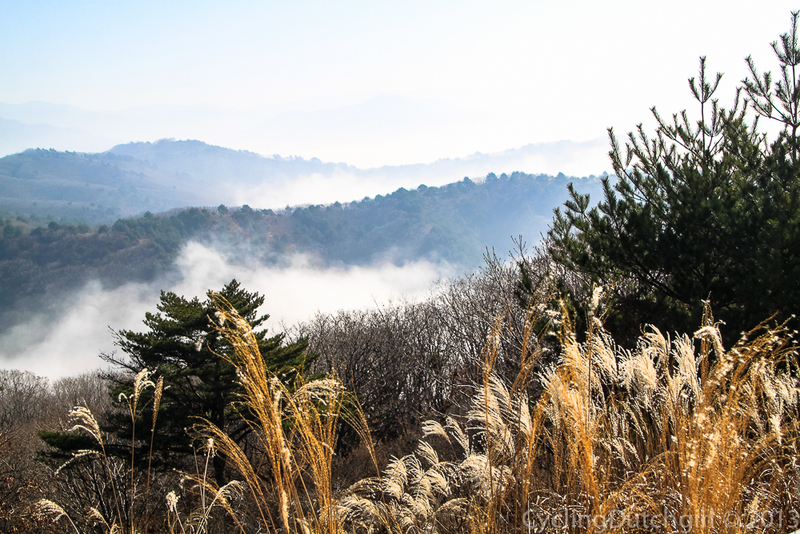 I was not all too convinced we would see a thing as a thick fog hang around the valley, but as we climbed the road we came out of the mist and were greeted with the most spectacular view! 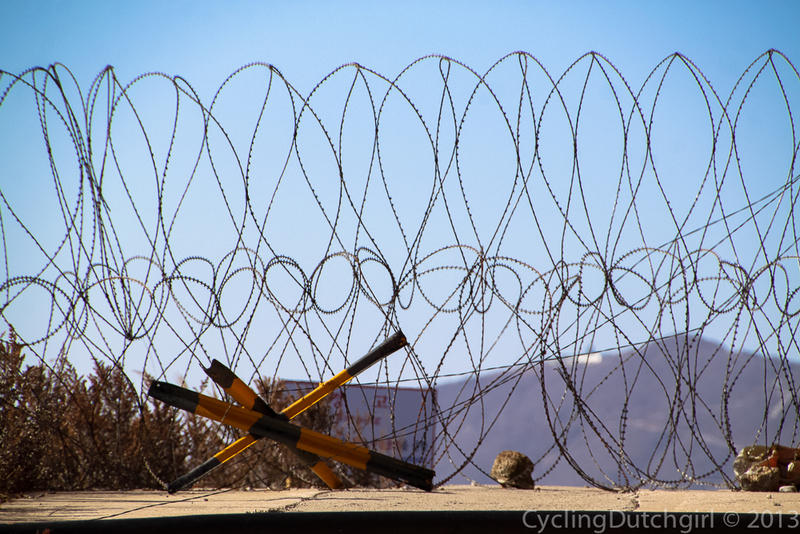 Our original plan, to ride up there, seemed a little silly as I had no idea you have to bring your passport and go through various military checkpoints to get there. Not to mention the 18% gradient. 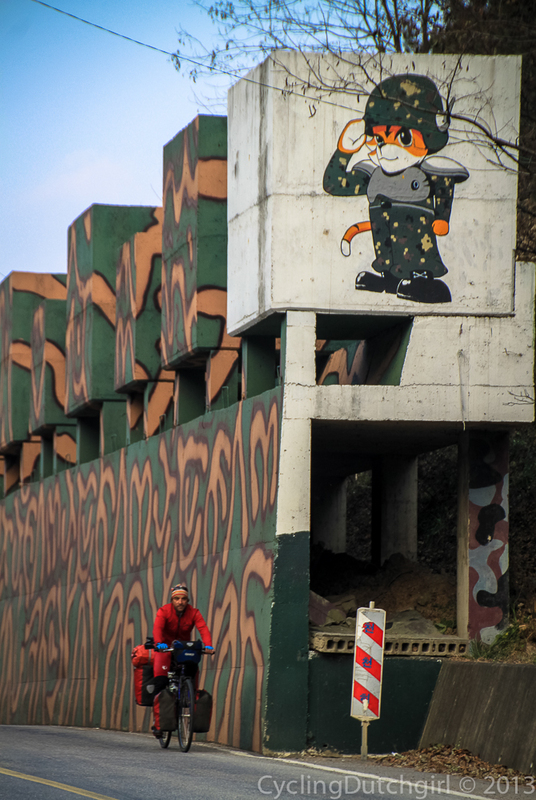 You’re not allowed to take pictures in the DMZ, the demilitarised zone. It’s some sort of agreement, a young soldier explained. As pictures would give evidence you have been there. But looking back over the south we could snap away freely, which we did. 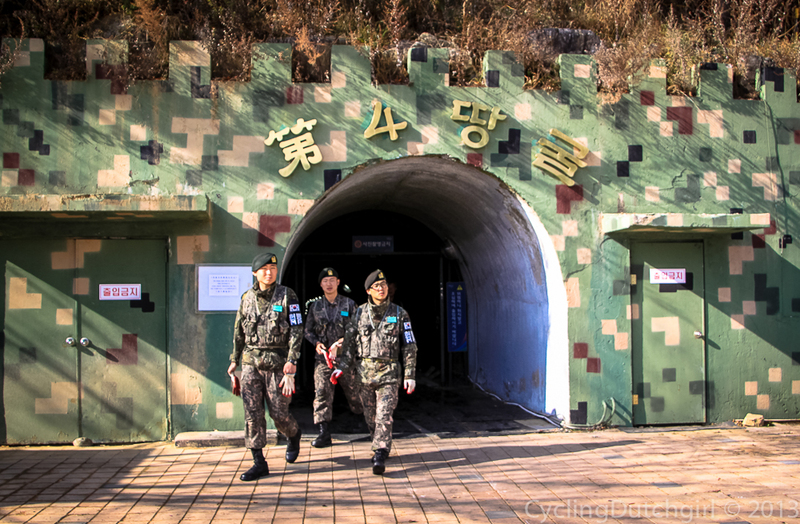 He then took us down to see the 4th infiltration tunnel. You are not allowed to take pictures there either. But I found this picture here. 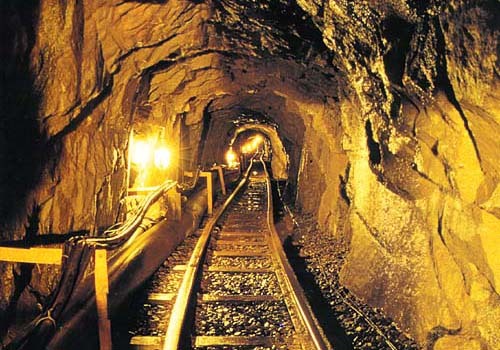 Apparently there’s 10 tunnels from the North to the South, 4 have been discovered so far. This being the last one in 1989. 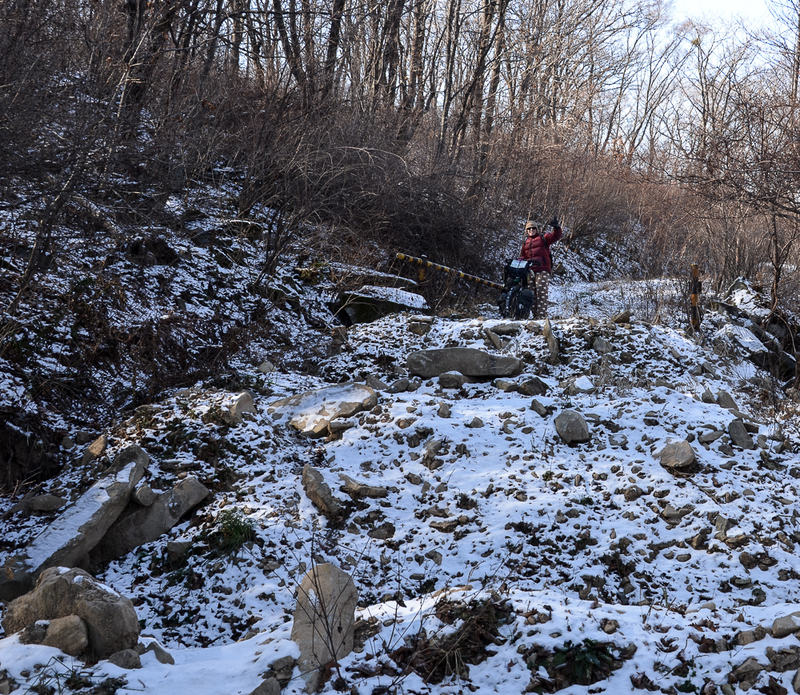 They (South Korean army) are still looking for the others by drilling holes and filling them up with water. If the water disappears there must be a hollow/tunnel underneath. Nifty. Every young man has to serve in the military 2 years . That’s not too bad if you compare it to the neighbour where it’s more like 10. For both man and woman. 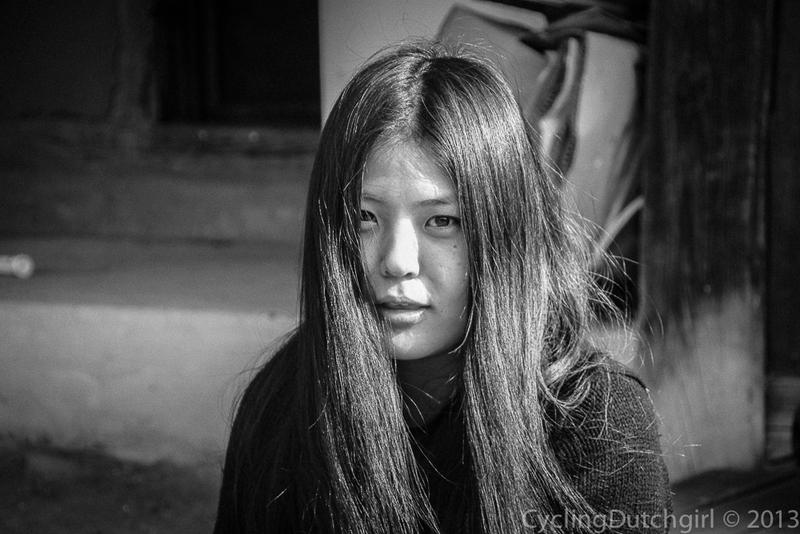 Cycling through the small town of Bangsan we noticed a gathering on a sport field. In no time at all we were invited to joined the BBQ and Mohammad played soccer with the kids. Her husband had been to town for a wedding and walked in on a party in his house. 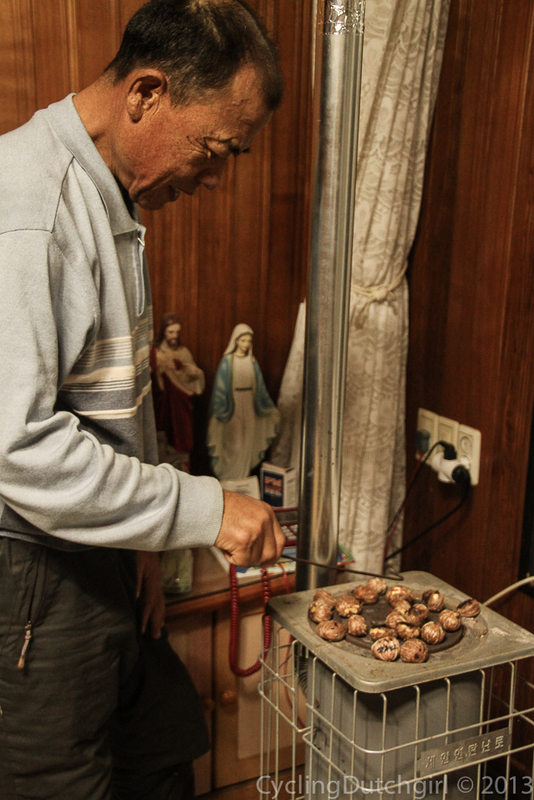 He didn’t mind at all and quickly joined for Soju and roasted chestnuts. It is getting a bit fresh up in the mountains. 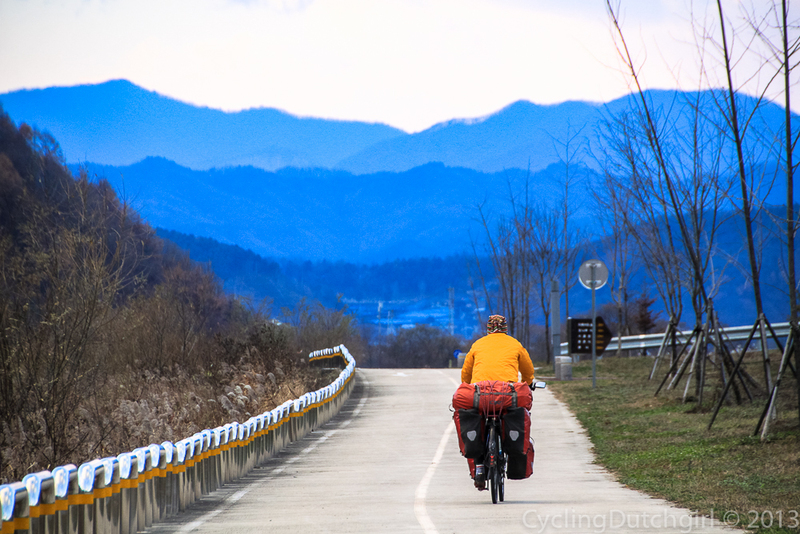 Our timing is perfect as we cycle through Korea’s coldest province, Gangwon, in winter. 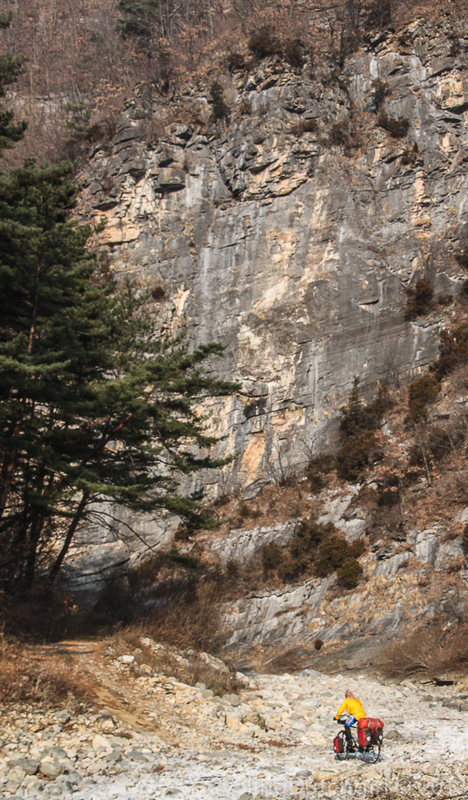 we got back onto one of Korea’s famous river trails. 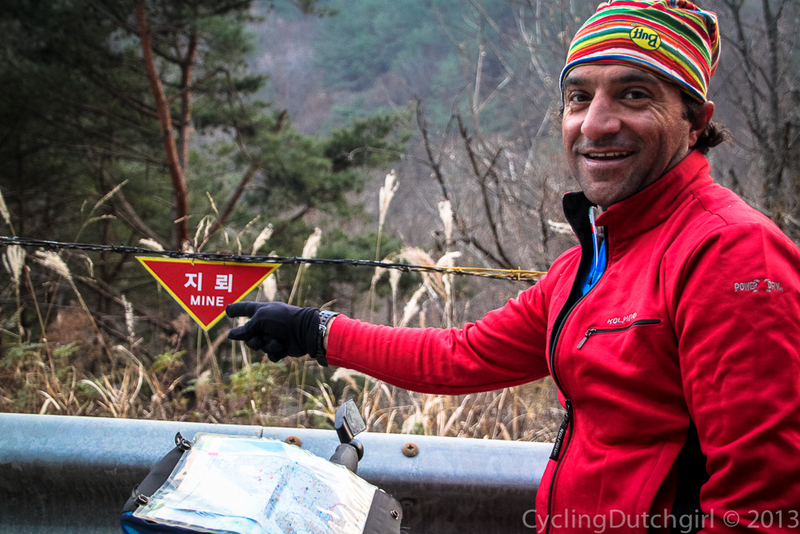 This time we located a track along the river from Hwacheon. 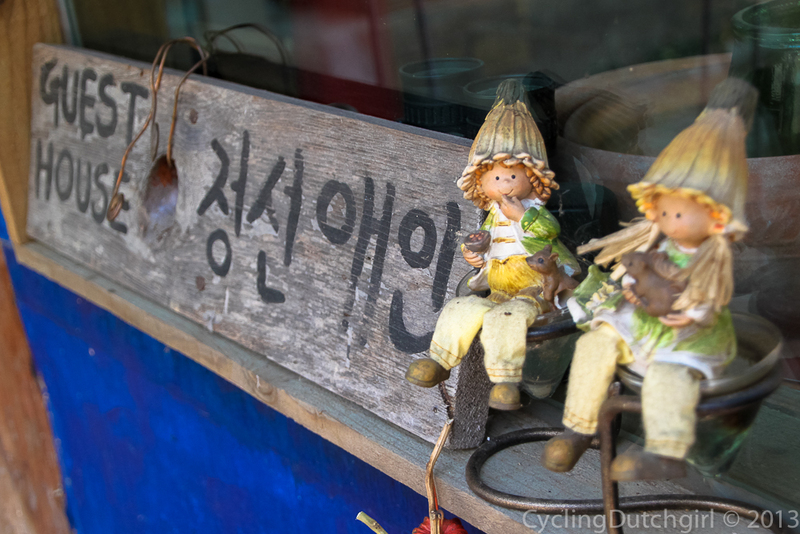 Happily we started peddling against the wind towards Chuncheon, where we were to catch up with some friends. But the trail had a different plan. At first it was a clearly marked bike road. Just after the 99km marker the road stopped and became a lovely path along the river. 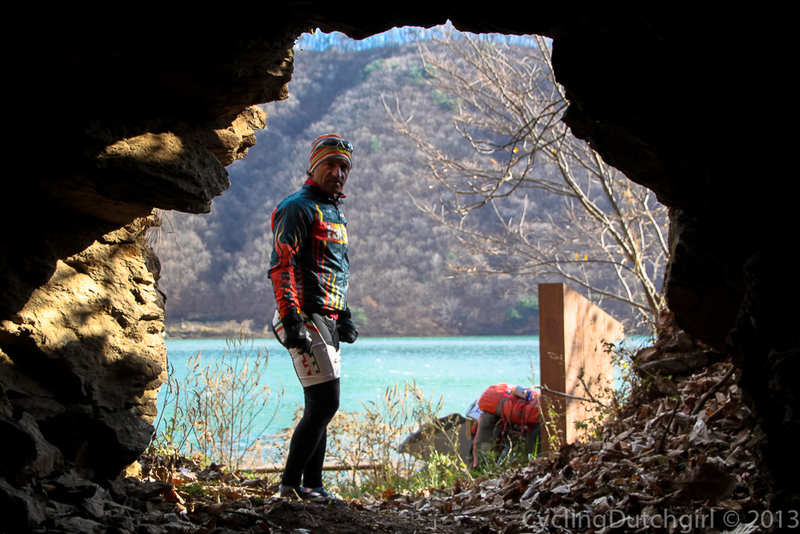 We found a cave that would’ve been an excellent place to camp were it not 11am. The path stopped too and suddenly there was just a small track that went straight up a hill. 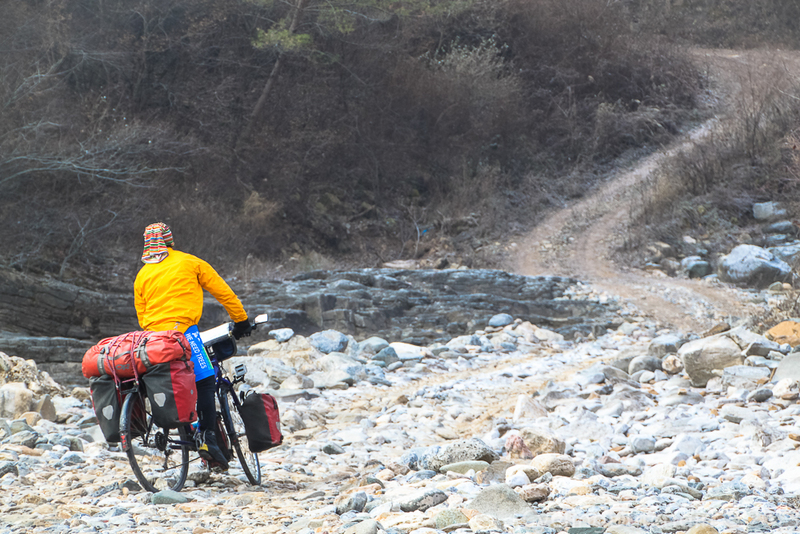 It was lucky we were together as there wouldn’t have been a way to get up this hill without taking all my bags off the bike and walking up and over a few times. 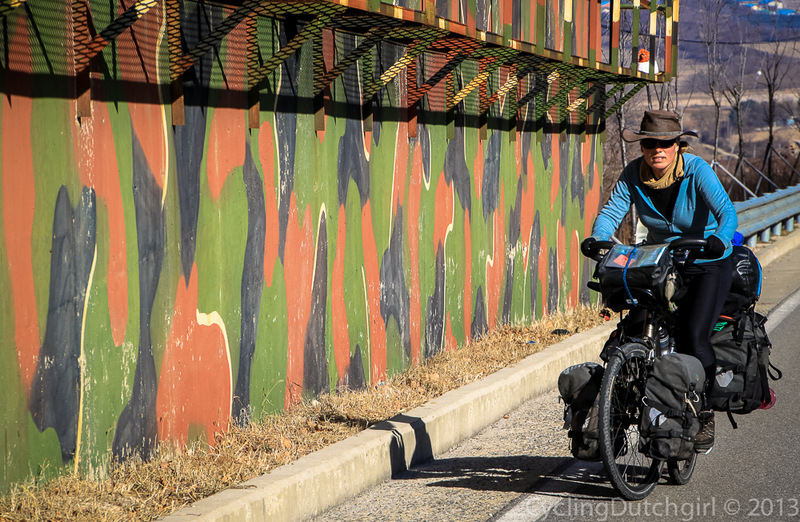 that got us to Chuncheon where we discovered we both have very different ways to navigate through cities. Where Mohammad tends to look at a map, finds the shortest way across and shoots through traffic like a rocket. I stick to the bike-lanes as long as possible. Even if I have to ride a few km extra. I do not like traffic. I wait for red lights and stick to sidewalks. But we made it and were warmly welcomed by Katie, Nikki and Stephen. All english teachers. 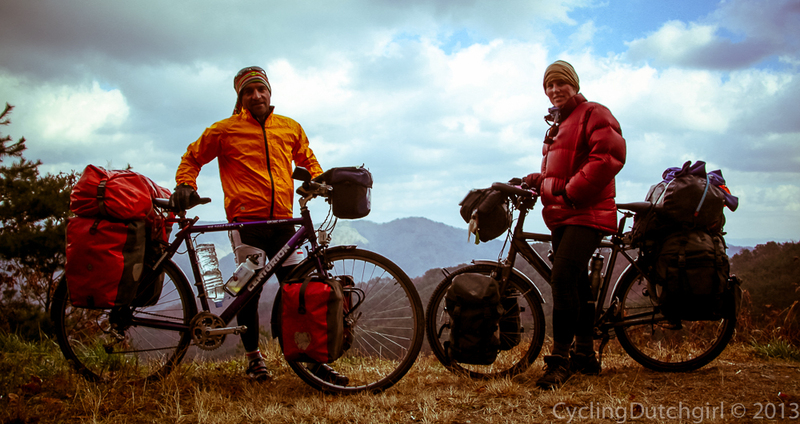 Katie & Stephen have ridden their bicycles halfway around the world already and run up hills, triathlon and marathons, just for fun! It’s really nice to meet people you’ve been friends with on Facebook for years already. Korea has (in my opinion) a slightly ridiculous education system. 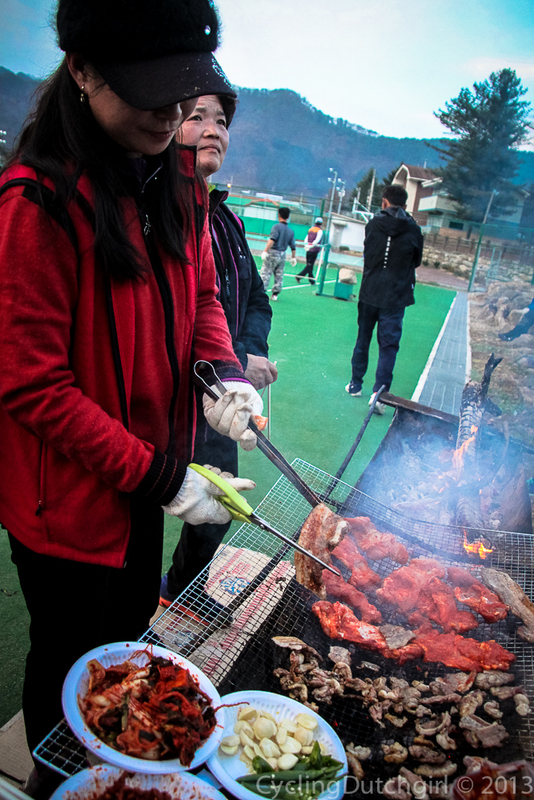 Most Korean teenagers spent everyday from 8am ’till 11pm in school! They have their normal classes and then there is about 100.000 Hagwons, or private schools, all around the country. 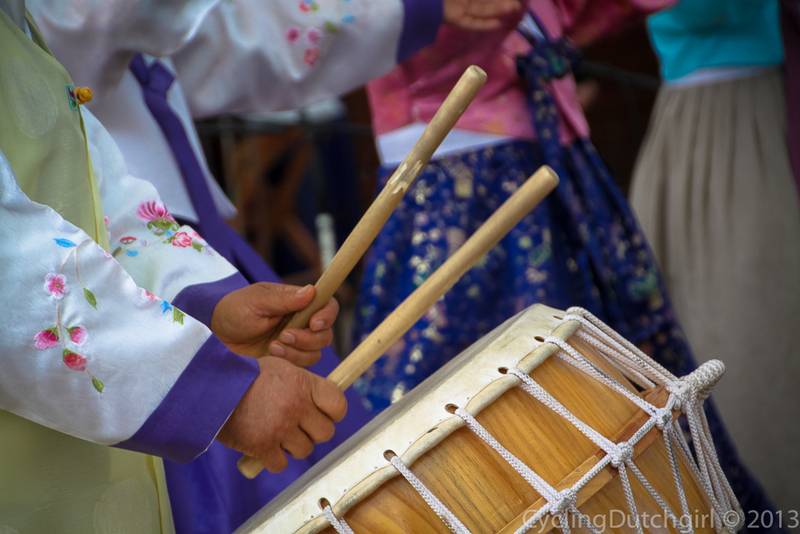 It made Korea the fastest growing country in the world in the last 50 years. We spent three days relaxing in their comfortable home before setting off again. There was a place I liked to get back to and Mohammad didn’t mind joining me. And there were a few roads I noticed on the map I liked to see too. It didn’t seem all to difficult to get to her house. 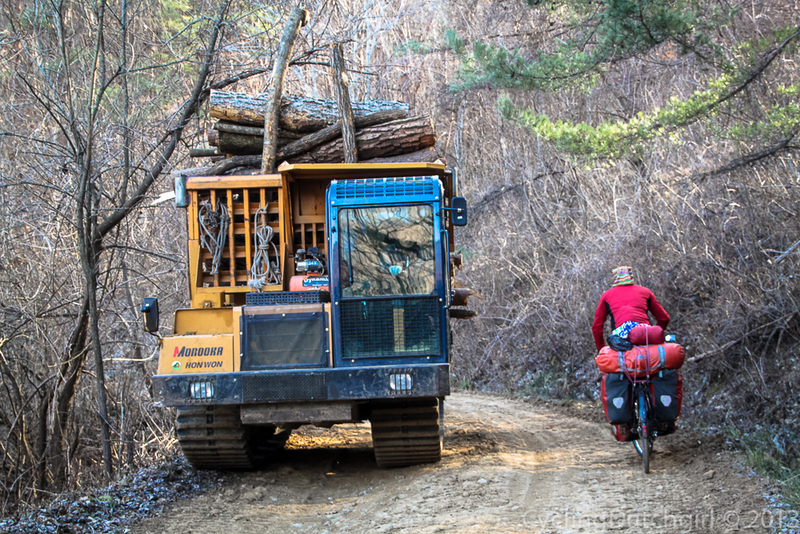 And the warning that it was 100km of unpaved roads seemed a little exaggerated. As the whole country is only about 200km across. When we got to the start of the road over the hill at 6pm we figured it wouldn’t be too hard just to get up and over that evening. And that probably would’ve been right had we not taken a wrong turn-off. The exaggeration of 100km unpaved road was probably truth if you look at the amount of roads/paths/tracks that criss cross this mountain. The actual distance shouldn’t have been more than 3okm though. 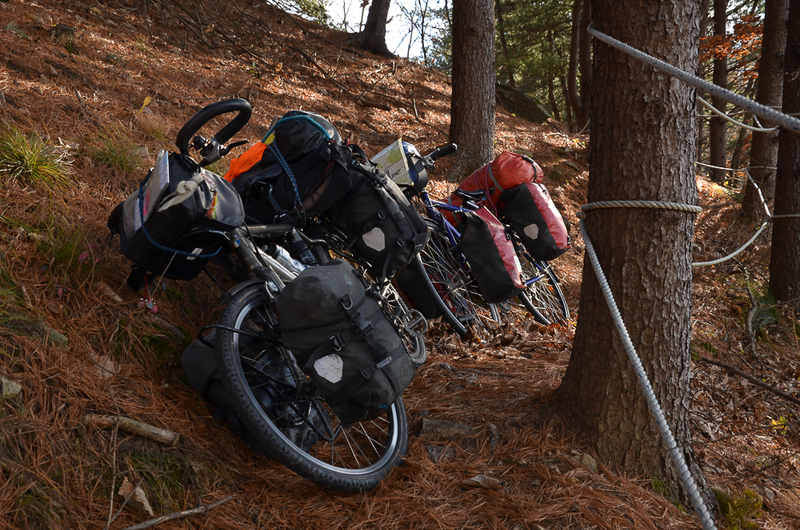 But after about 3 hours of pushing the bikes up a very very steep and slippery track the path stopped going up. “As long as were not going down we should be alright” mentioned Mohammad. Just before the road started going down. By this stage it was 10pm and already about -15 degrees. And even though he told me he happily keeps going all night. He used to go on overnight hikes and loves the dark forest. One of my favourite things to do at night is sleep. And we agreed to pitch the tent at the next opportunity. Since there was no flat spot I thought the logging camp we passed seemed a perfect spot. 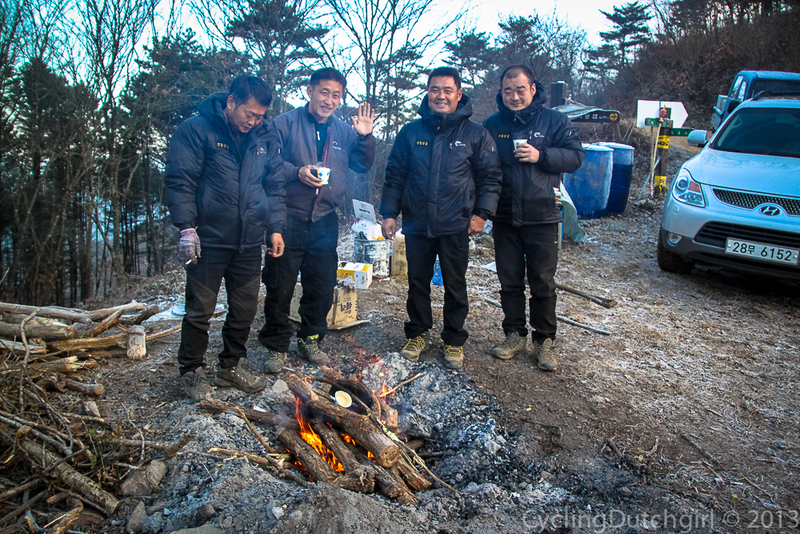 That feeling was only confirmed the next morning as the crew had built a nice fire and offered me some coffee as soon as I stuck my head out of the tent. 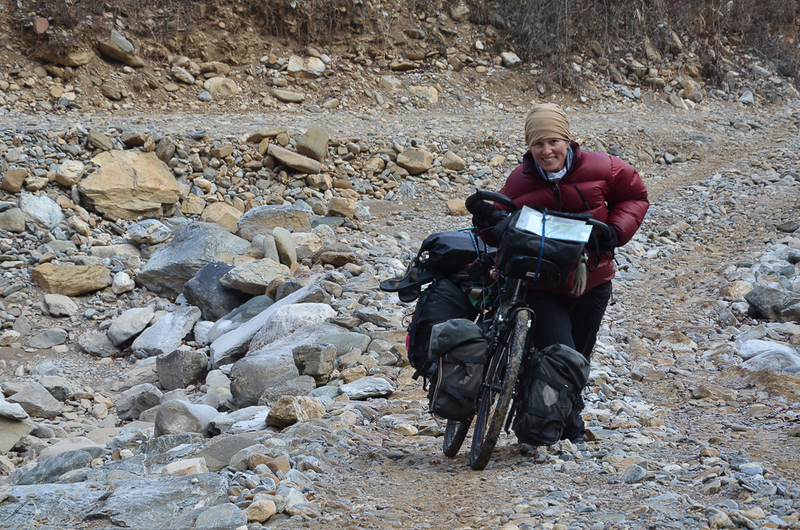 We were told the best way to get where we were going is to get back down and take the sealed road around the range. But that just didn’t sound like fun at all. As it turned out Mohammad likes backtracking as much as I do. As we passed another track heading up we figured that must be our direction. All we needed to do is get over this hill and into the next valley and we should be alright. We found ourself on the power line maintenance tracks. They are not very well maintained. After a few false turn offs that ended up nowhere we managed to find the way down the other side. It turned into a bit of a road and suddenly I recognised the place. We made it! and set off the next day to find this road Alleykat had told me about. and just after town we found our road! Coming down the hill at enormous speed suddenly I had the feeling my bike wanted to do something else. I just managed to break without coming off. 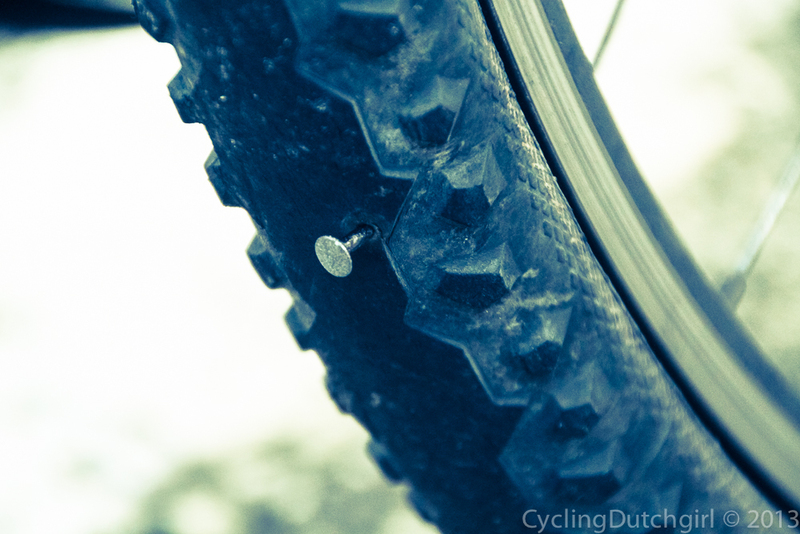 Turned out my tyre met a nail. And didn’t like it much. I fixed the it while Mohammad made a coffee. But as I started to pump it seemed something was a little more wrong. The whole valve had come off! I knew for sure there was a spare tube somewhere in my luggage. But for some reason I just couldn’t (or maybe didn’t want to ) locate it. Luck would have it that this is Kim, Hyung-Goo’s territory. He’s an artist. And a teacher. And he runs the local community house. Ready for a big day on the road and actually planning to end up in Seoul we broke a record. 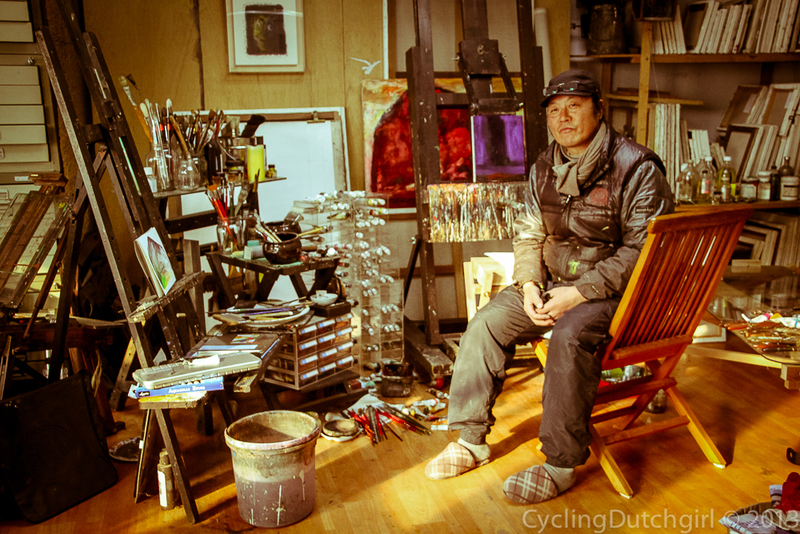 His world turned out to be a glorious little guesthouse. And it didn’t matter we just stopped for a coffee 400 meter down the road we couldn’t just roll by. Mainly because the road was a little too rocky to roll. 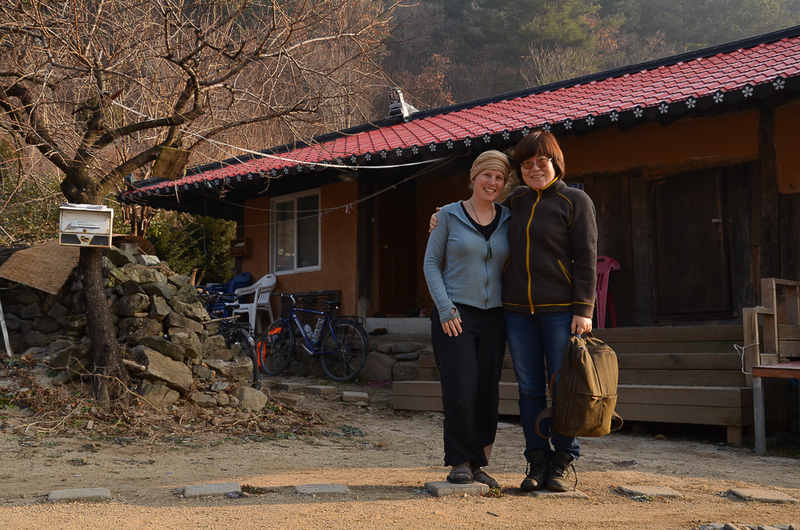 A wonderful place here in one of the last unpaved valleys in Korea. Truly a spot we couldn’t pass by. So we didn’t and stayed the night. He later told me it was the back-end of a cow. A bit chewy but not bad. It rained the next morning. 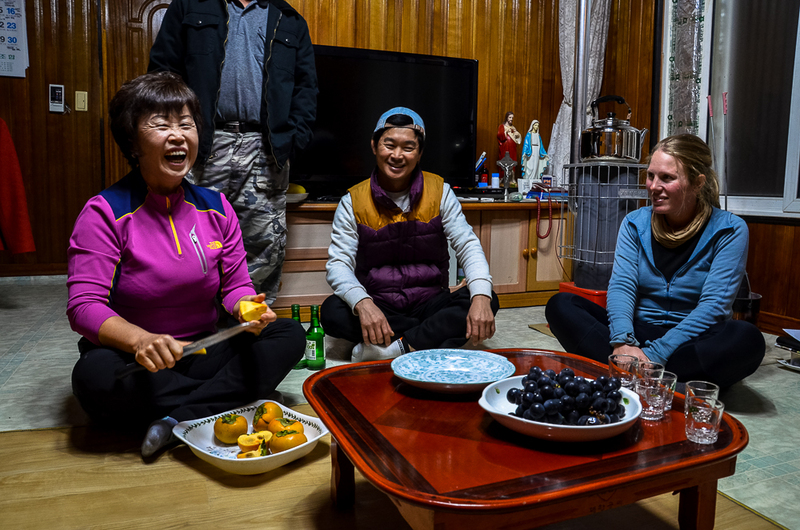 And with a mission to end up in Seoul our new friend dropped us off at the bus station. 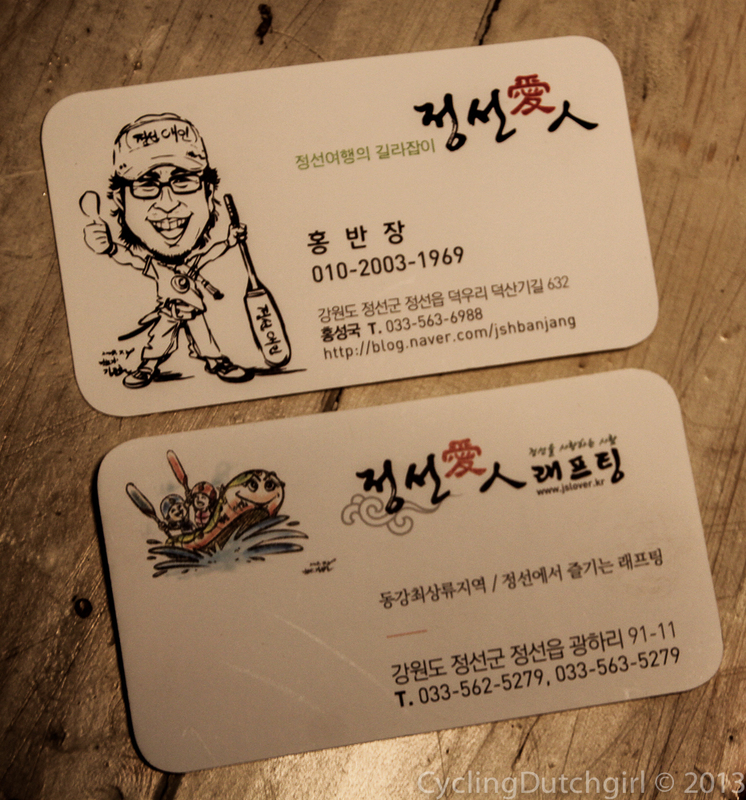 If you ever happen to be in the area (and if you can read Korean) Make sure to call in! This was my final destination. My visa for China that cost me so much hassle to get will not be used. I got on a plane at Seoul. It was a little delayed. I don’t like flying at the best of times but after two movies in the air and with a ground speed of 768km/h I opened the little window to have a peek outside. And I saw this most awesome view. Beautiful snow on mountains and a wide river going through it. Unfamiliar names on the map like Krasnojarsk and Novosibirsk. A new plan starts forming in my mind. But for now I have some new family members to meet. And friends to catch up with. 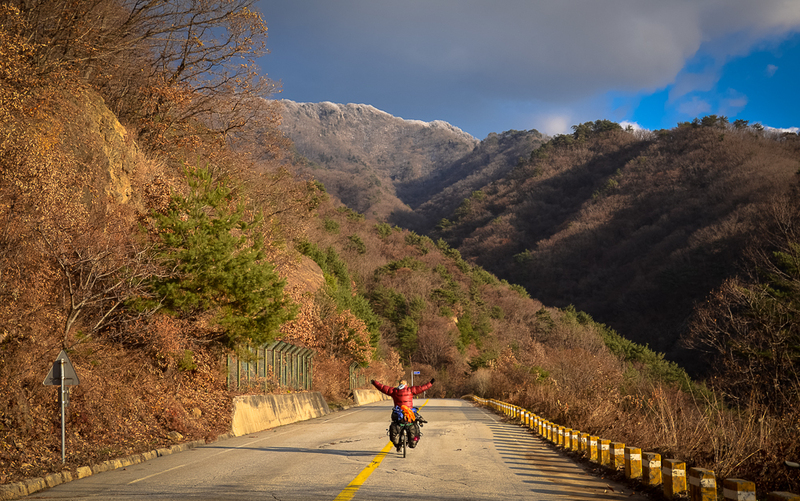 This entry was posted in Korea and tagged adventure, bicycle, company, hospitality, Korea, mountains, North Korea, river roads, rocks, travel, winter. Bookmark the permalink. 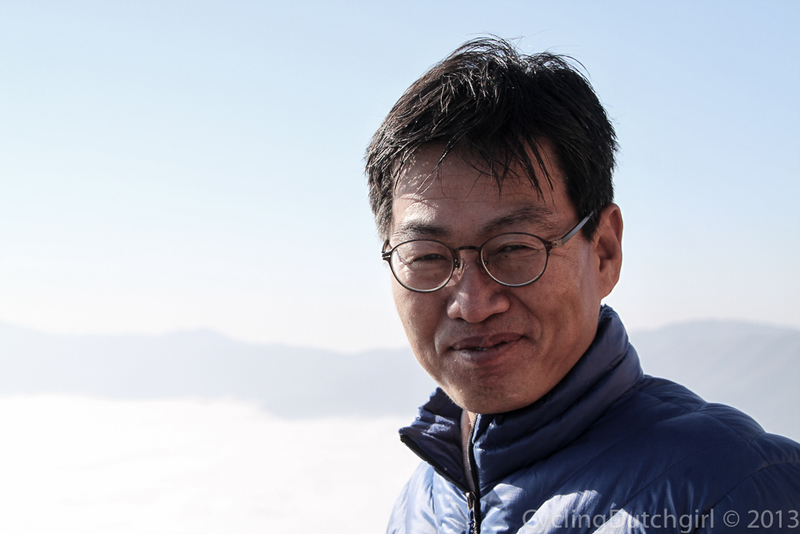 Wow, I just loved your story and your unfatigue able spirit, it made me want to go to Korea and explore. Where will you go next? Een nieuw plan? Ben benieuwd! Blijf je lang in Nederland? Heel veel plezier met de (nieuwe) familie! You make me smile, have a good time back “home”. Happy parents, to have you home safe! Lovely photo with your family…have a great Christmas and enjoy your wonderful family. Can’t wait for the next chapter on your travels. More fantastic memories for you. Have a great Christmas back “home” in Apeldoorn. Say hi to mum and dad for me. All the best from Oz. Good stuff again but no dance pics I am shattered ,keep smiling. I recognize the airport! Makes me miss Holland a lot. I have so enjoyed reading about your travels. 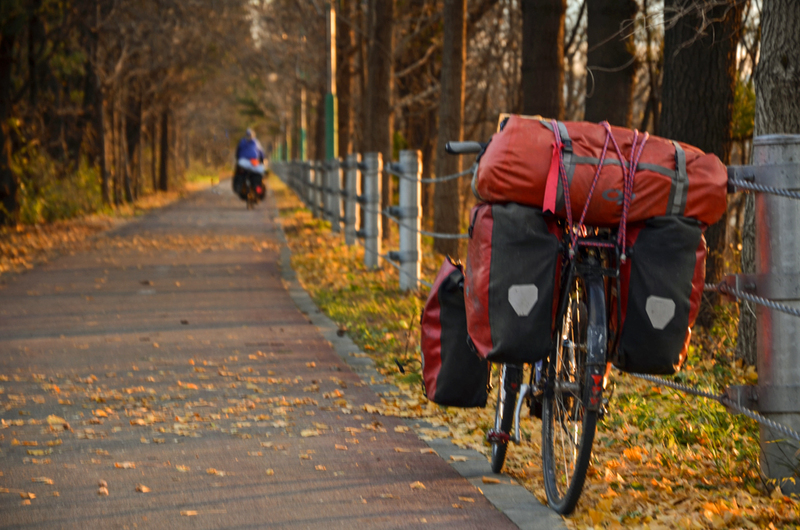 Enjoy your visit with your family but hope your travels are not complete as alot of people bike travel thru you. Enjoy the christmas season . People think I have adventures but you took it to a new level. Loved your stories. If you ever make it through my part of the world – not that I know where I will be living next – I hope to offer some hospitality. Wat een prachtige foto’s weer! 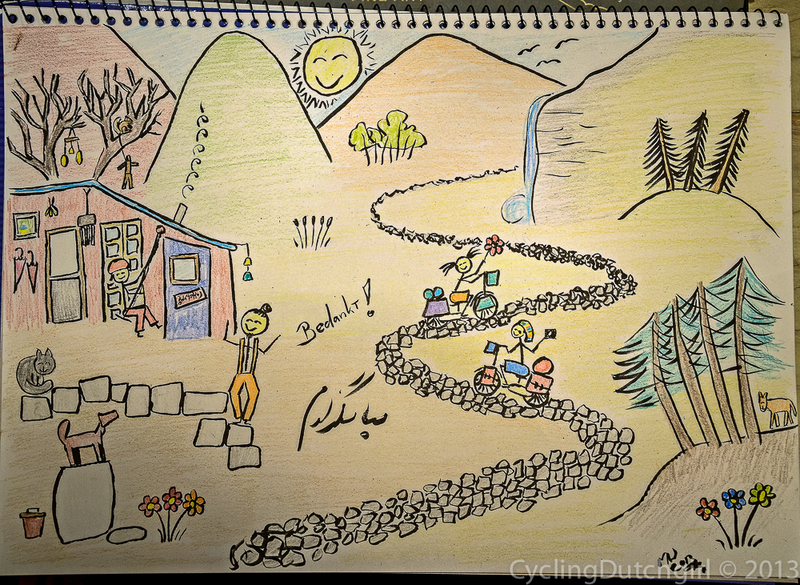 Geniet van je tijd in Nederland met vrienden en familie (en als ik de Schiphol-foto goed bekijk, is je fiets ook meegekomen). 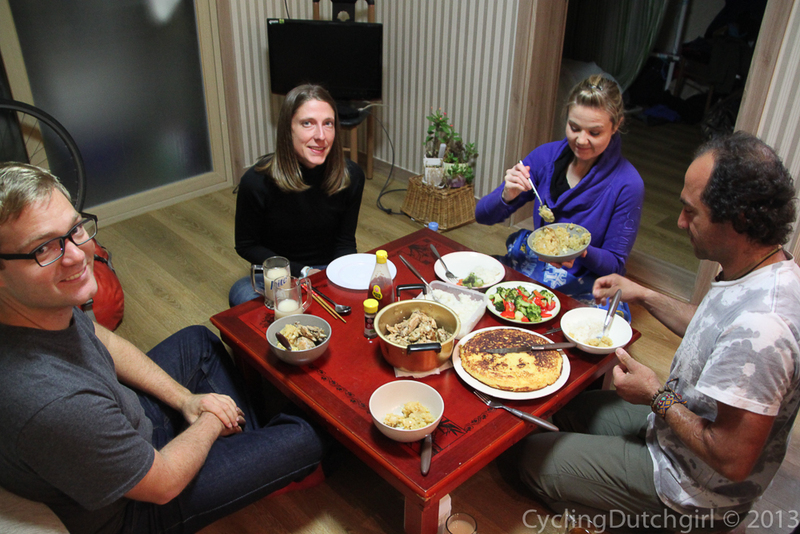 The cyclingdutchgirl has gone home for Christmas! This unforeseen development has some wondering, what’s next? 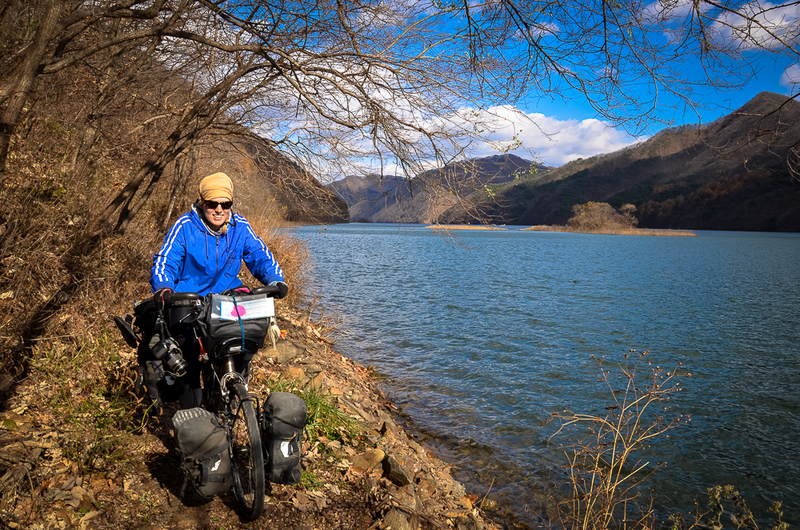 While she doesn’t have to continue cycling throughout the world, hopefully she will update us every once in awhile because she’s such a delightful storyteller and adventurer. You must be having really great time with your family for sure! My mother wants to know that when i see you so i facebooked you and noticed that you have already gone! D really like to see you in seoul however you gone.. I should have messaged you before! My mom and dad just want to know how you are. If you have any free time just text me! And ill translate that for them. I wish good luck for 2014 – madness and then China. Hi, just connected with your website…..too awesome! I’ve been sitting here an hour or more checking out all the places you’ve travelled. I’m just now putting my own custom touring bike together….so fun! Wondering how you like the Rohloff speed hubs? I want these and hopefully making the right choice.